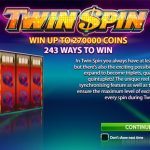 Experience the classic Las Vegas style of gambling by playing NetEnt’s excellent Twin Spin slot with the bonus feature to boost your winnings. NetEnt has been a consistent developer of great games for years now. Their offerings have been consistent in terms of gameplay and graphics quality. 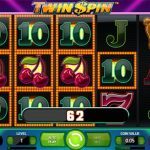 Twin Spin slot is no exemption. While other games go for more thematic designs, this game goes back to slot machine basics, evoking classic nostalgia for the slot machines of the past but adding its own twist. 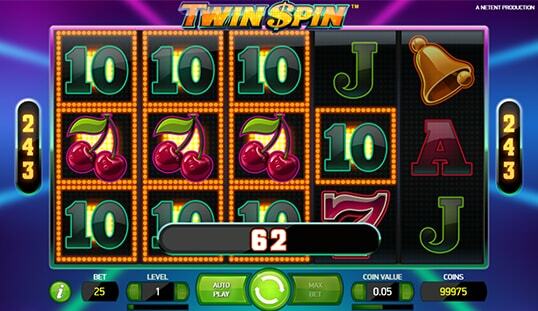 The main idea behind Twin Spin slot is that it acts like a classic slot machine but is updated to modern sensibilities. It shows in the graphics and sounds of the game as the reels are spun. Flashing lights and glittery effects ensure that players pay attention to the game, while the sound effects make it even more fun. 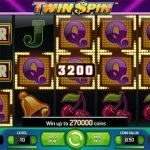 The symbols are exactly what people expect from a classic slot game. 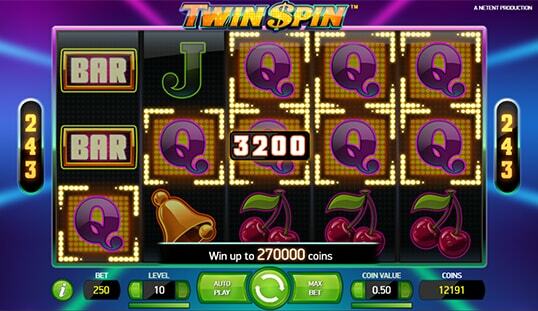 The basic gameplay is also fairly similar to how the old slot machines worked. Just spin the reels and hope for a combination. The difference is that instead of just having one pay line, players can win in over 243 ways. All they need is for a symbol to show up in all five reels starting from left to right in order to win. Three is the minimum needed, with the highest prizes being for five symbols matching. Additionally, there are 10 levels of betting, with level 1 being at 25 coins, to 10 at 250 coins. But this depends on the operator how each coin is valued relative to the currencies accepted. 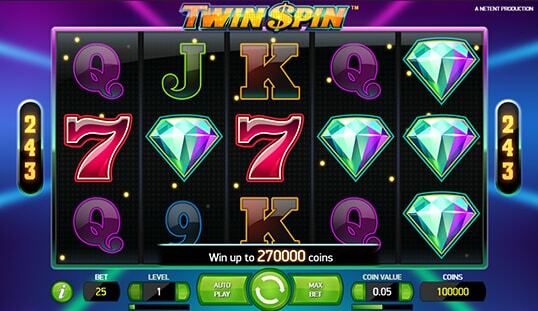 The main special feature of Twin Spin Bitcoin slot is the Twin Spin. Players can unlock this feature when two or more reels give matching results. What’s great in this game is that it does not matter if the identical symbols appear on the first two, on the middle, or on the last two reels. As long as two reels show similar symbols after a spin, this feature is activated, which will give the players a better chance at scoring a bigger win. Moreover, this feature can extend up to five reels. 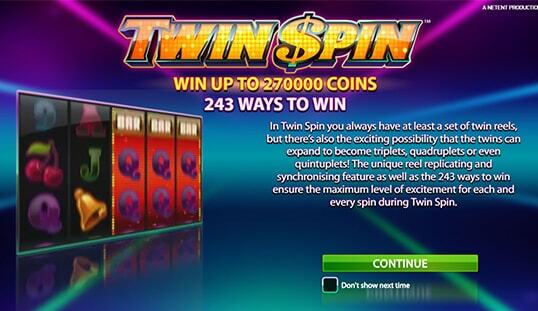 Twin Spin slot is easy to play and has increased chances for a player to win. The classic feel that it evokes should be a fun diversion. 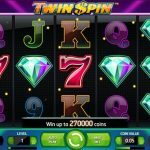 If people want to play Twin Spin slot with Bitcoin, then they can do so on some of the popular Bitcoin casinos that carry NetEnt Games. It’s easy to find these casinos, some of which are BitStarz, BetChain Casino, and BitCasino.io.